What is the Best & Most Cost Effective Waterproof Coating for Flat Roofs? Liquid Spray Applied Membranes (LAMs) repair and restore just about any type of leaking roof. And without the need to remove the existing roof membrane & surface. Spray apply directly over failed & leaking coatings - saving time & money. * Ideal for Repairs to Existing Roofs - either concrete or metal. 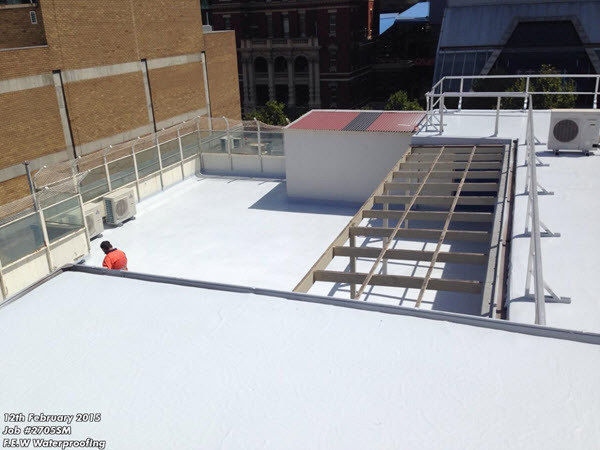 Liquid Applied Waterproofing Systems are a cost-effective alternative to roof replacement. 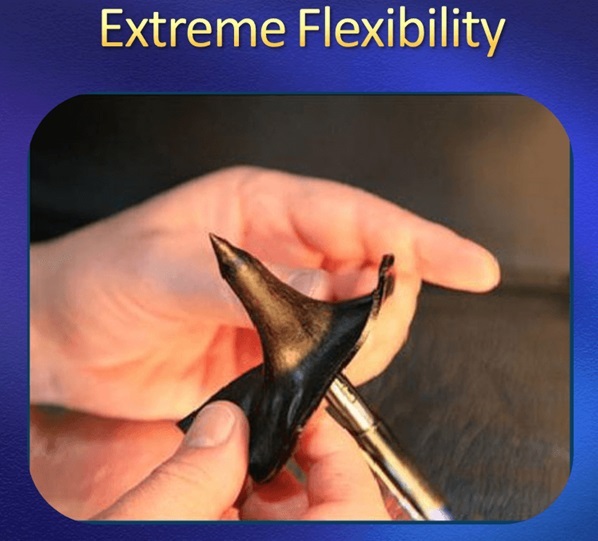 Liquid Membranes will contour to any roof shape: clip lock metal profile, corrugated iron and ideal for "busy" roofs to seal around & under roof utilities and services. Roof coatings designed to extend the life of your existing roof, without the expense of removal and new installation. 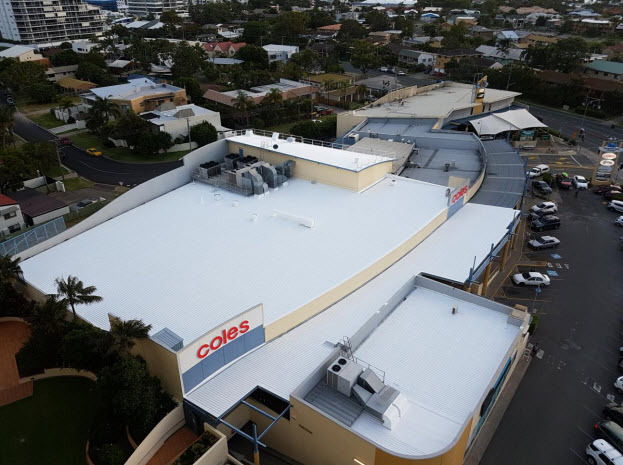 In addition to cost savings, our spray-applied liquid roof membranes provide a non-disruptive approach to building roof maintenance, allowing occupants to continue their activities without interruption during roof restoration. 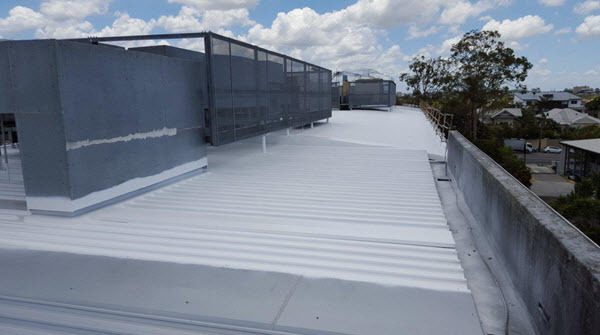 Roof Restoration & Waterproofing Systems which simultaneously reduces landfill waste and contributes to energy savings by meeting cool roof requirements (based on the particular coating applied). 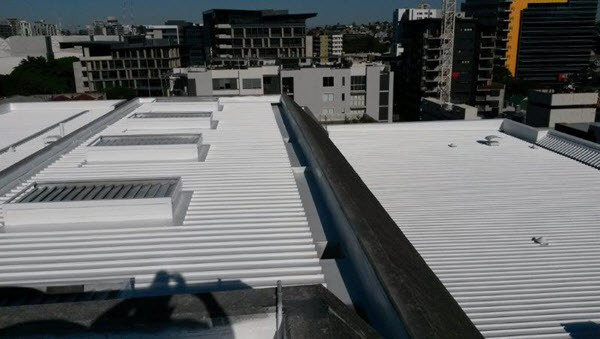 Fully Warranted Roof Restoration & Waterproofing System consists of options that are compatible with most roofing substrates & provides permanent water protection for flat and low pitched roofs - metal, concrete and timber substrates. Up to 3 times faster than conventional sheet/torch-on systems. Extremely fast installation & providing significant cost ﻿﻿savings due to reduced time﻿. Very often the Findlay & Evans Team can over coat the original roof in a SINGLE seamless spray application of a liquid membrane. Liquid Applied Membranes﻿﻿﻿﻿﻿﻿ provide a robust, long term solution for all roof surfaces - new & existing. Liquid membranes are the state-of-the-art alternative to removing and replacing the existing leaking﻿﻿ roof.. 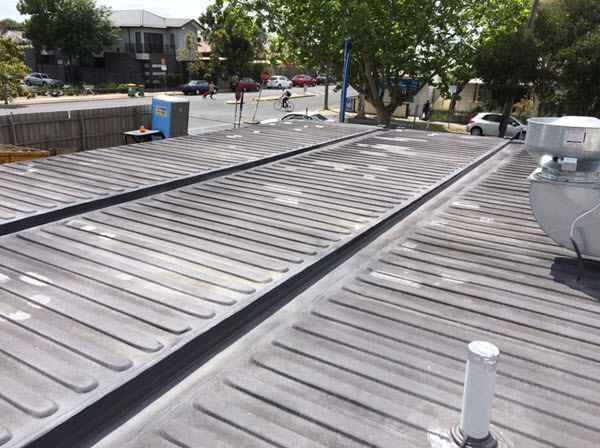 Most often roof replacement is not necessary – after careful preparation our roof waterproofing system can be sprayed over existing surfaces. Seamless, flexible, elastomeric membranes are designed for residential, commercial and industrial roofs: flat, concrete or metal, old or new. Providing robust long-life waterproofing membranes for all types of roof surfaces, conditions and structural challenges. 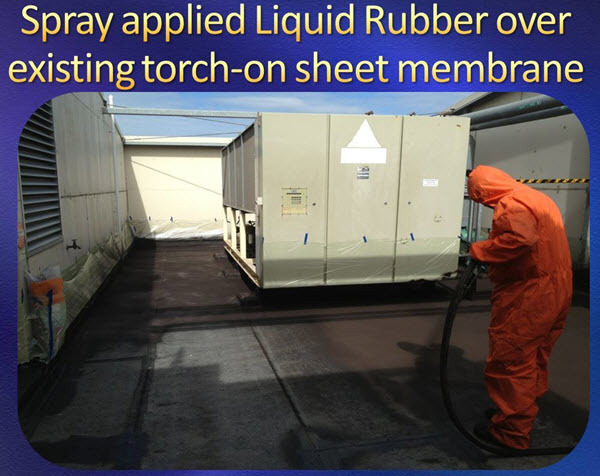 Our spray equipment can be dismantled and easily re-assembled on multi level rooftops. This means we can provide waterproofing membranes for all roofs surfaces - no matter how difficult the access. 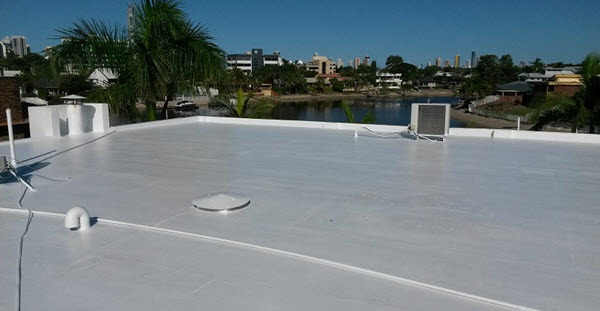 Spray-apply liquid waterproofing will overcoat the entire existing roof surface – in many cases there is no need to remove the roof or even the existing failed sheet membrane. These hard wearing, seamless, monolithic and flexible waterproofing systems that can also be structurally reinforced. 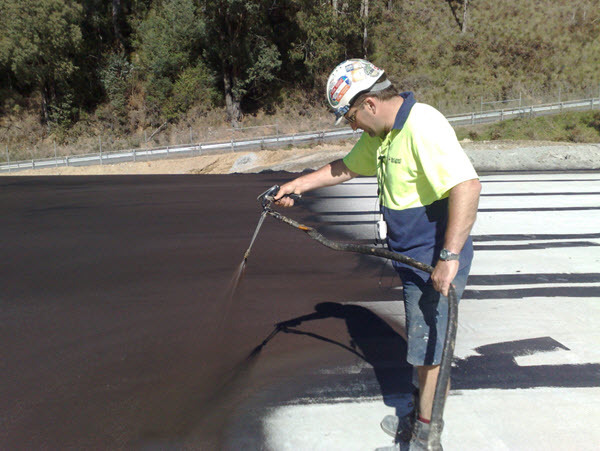 Liquid Applied Membranes (LAM) are capable of resisting UV rays, encapsulating asbestos, withstanding “potable” (standing) water and coping with structural movement and deformation. Our reputation is one of honesty, integrity & professionalism. 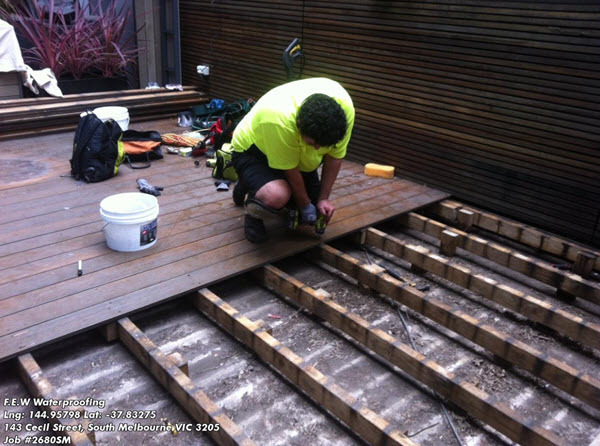 All water restoration and repairs are supported by our Melbourne based waterproofing company - we stand by our work, uphold all our warranties and return to provide ongoing service & maintenance. The Findlay & Evans Team are OHS compliant and Certified Applicators. All Waterproofing Product﻿﻿s supported by manufacturers warranty. Liquid Membranes - Fast & Instant Set Waterproofing Solution for Challenging Projects. 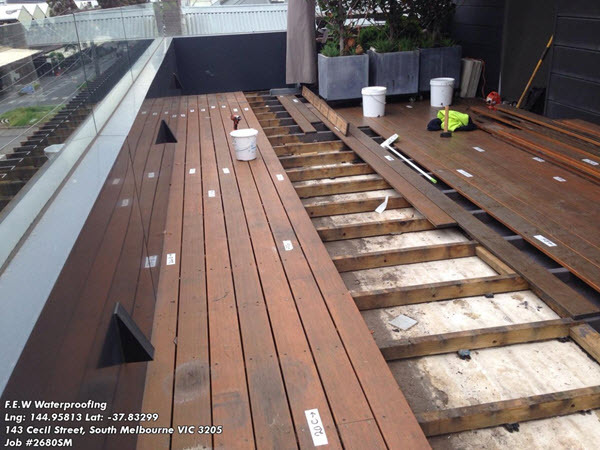 Timber decking can be built over and structurally integrated int​o a waterproofing membrane below . Very often such a design can cause catastrophic failure for the waterproofing product due to penetrations through the membrane causing areas for future water ingress. This Case Study demonstrates the versatility of Liquid Membranes - ideal system providing a water barrier around structural supports. Findlay & Evans have developed a complete system providing: waterproof membrane, protection barrier and instant turf finish. ﻿﻿﻿﻿﻿See here for further details. 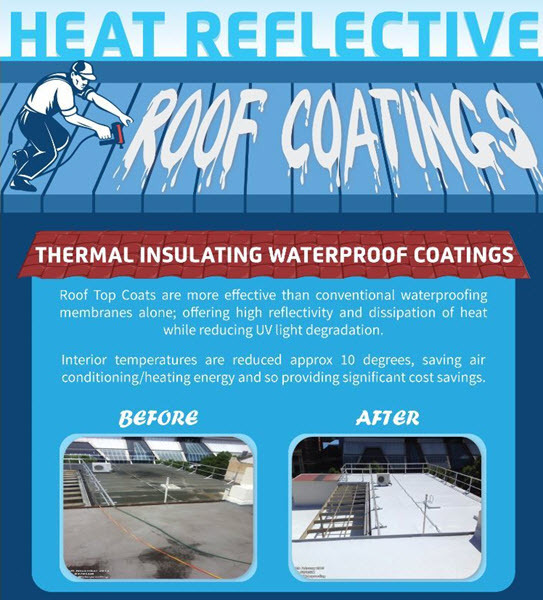 Heat reflective waterproofing membranes vastly improves the appearance of existing roofs while saving heating/cooling costs by reducing interior temperature up to 10 degrees. Liquid Waterproofing Membranes provided a fast & efficient solution to this challenging project – it was impossible to remove the roof of this historic power station – spray application was the ideal method. Case Studies - some of our completed roof waterproofing projects - click links below. 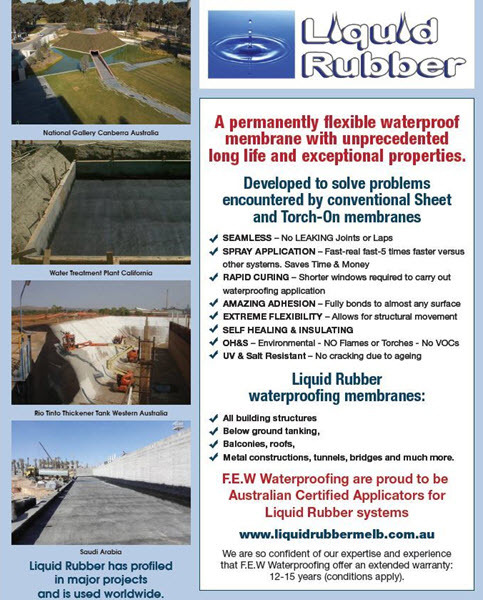 Ideal waterproofing product for small projects and for trades. BuildIT: AIW Committed To Raising Waterproofing Standards And Training in Australia. Facility Perspectives: Solving Roof And Balcony Leaks Is Not Just About Waterproofing. LookUpStrata: If It Has A Balcony, It Will Leak.